achieve higher machine productivity and product quality. The state-of-the-art design of the PAK•PLS, utilizin3 surface mount technology, makes it possible to package a full function PLS with 16 outputs into the smallest PLS on the market (2.2"H x4.2"W x 6.2"0). This space-saving housing (9.2 sq. in. panel space) makes the PAK·PLS extremely compact allowing the PLS to retrofit in crowded panels. The PAK·PLScontainsall the necessary electronics circuitry inside its very compact housing, to directly interface it to PL C's. No separate chassis is required for this purpose. All input and output wiring is done through plug-in type terminal blocks which make it easy to do installation or maintenance work. Optically isolated inputs and outputs are standard to provide enhanced noise immunity and ensure operational integrity of the PAK·PLS in harsh industrial environments. The PAK•PLS has built-in-circuitry which continually monitors the operation of the unit. If any of the resolver wires break or short together, the Broken Wire Detector will cause a fault condition. A fail-safe fault output is provided which is energized ONLY if: the resolver cable is intact, the customer power supply is present, the line voltage is within specifications, or the processor is not in reset. The fault output will de-energize if it detects any of these faults. The PAK•PLS can operate up to 1800 RPM with a repeat accuracy of 300 microseconds scan time. The large LED displays provides good visibility up to 30 ft . in plant environments. The user-friendly front panel simultaneously displays correlated parameters such as channel#, "On/Off' set points or program II, angle, and RPM allowing a simple man-machine interface. Resolver alignment to machine "zero' and fine-tuning motion is accomplished through our patented arrow keys which increment or decrement the machine offset and/or setpoints. solenoids. The speed compensation advance is fully adjustable from O to 359 degrees per 10 RPM. The PAK·PLS can internally store four independent programs for different jobs. With a pre-programmed PAK·PLS for different product runs, the product changeover is a few simple key strokes to select the program corresponding to the job. Remote selection of PLS programs may be accomplished by a PLC. or an external selector switch. positions after detection of an upcoming product. The built-in shift register option allows you to register an event now and take action at a certain programmable length later (from 1.0 to 50.0 turns of input shaft), such as sensing a defective package now and rejecting it later. Four channels are reserved for shift register outputs, when provided with this option. The optional M1151 Brake Monitor automatically measures the time in ms from an input brake signal until the resolver shaft stops rotating. This stopping time is then compared to the programmed Warning Time and Danger Time and the appropriate Safe, Caution, or Danger output is energized as a result. 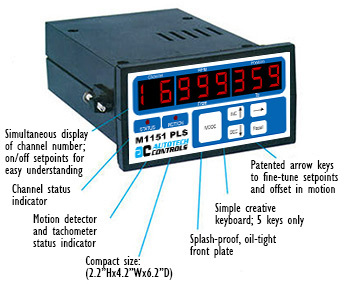 The M1151 Brake Monitor is normally applied as an indication control on metal stamping presses. The brake wear monitor uses three PLS channels. Unlike some other PLS's on the market today that use optical encoders with inherent limitations such as optical alignment and LEO aging. the PAK·PLS uses a mil-grade resolver. This resolver has been extensively used in the military, aerospace and industrial applications forovcr 50 years. The PAK•PLS is an extremely accurate and reliable positioning device used for controlling radars, tanks, spacecrafts, etc., under the most demanding environments. Over the last 15 years, Autotech's resolvers have become the industry standard in the automotive, can manufacturing and packaging plant industries. 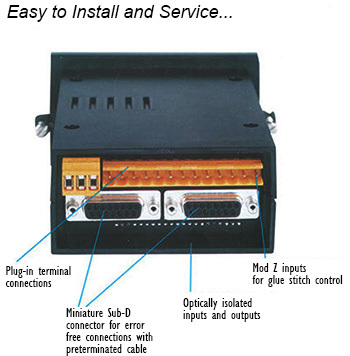 The PAK·PLS uses the standard Autotech resolver circuit that has the unique characteristic of being short-circuit proof. Thus, in case of an accidental short in resolver wiring, a costly damage to the PLS and resulting down-time is avoided.